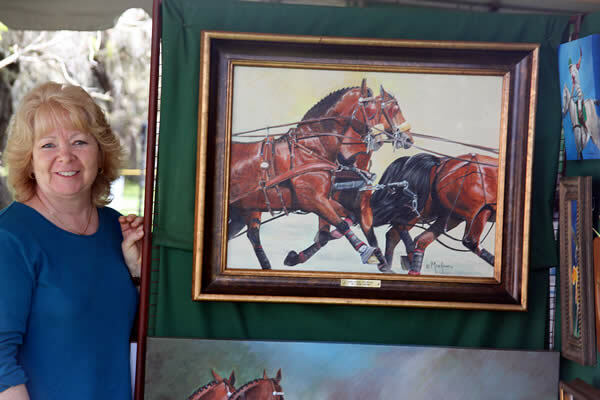 Equestrian artist Moe Hahn shows off a completed painting of Chester Weber’s winning four-in-hand team. The horses in Hahn’s newest painting are part of Weber’s famous four-in-hand team. Weber broke his own record this year at Live Oak, winning the USEF National Four-In-Hand Championship title for the eighth year in a row. Weber now has his sights on representing the United States in the World Equestrian Games in Kentucky this fall. For more information on Weber and his horses, visit Weber’s website at www.chesterweber.com. 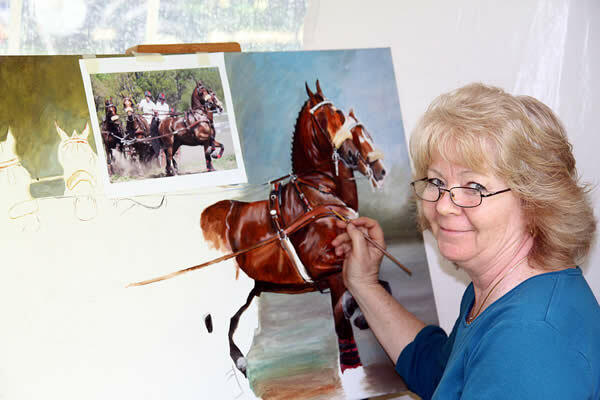 To meet Hahn, or see her paintings, stop by the OBS Feed Stores in Ocala. Hahn can also be reached at 352-694-1592.